Corrosion-resistant interior and exterior—unlike corrosion-prone steel cylinders. Nitrox-ready: The Scuba Diving Tanks can be charged with oxygen enriched air immediately after purchase. As an aside I was never able to get the 9 ounce paintball tank pictured below to run. The black paint was buffed off the bottle and the larger small tank is a SodaStream CO2 bottle. 12 ounce CO2 paintball tanks are pretty good snorkelers however. The SodaStream bottle like the long, tall, 9 ounce paintball tank is too tall for the width I believe. A 9 ounce tank is slightly taller than 12 ounce tank too. not what you might guess. Last edited by Mark on Sun Sep 24, 2017 3:00 am, edited 8 times in total. Anyway, this is what 3 tanks or nearly 100 pounds of aluminum looks like. For review the piglet snorkeler is 2.5 gallons and the tanks about 3 gallons. It was more recently that I took to using this wider diameter snorkel pictured on the piglet, in winter it's nearly impossible to talk to someone next to you, it's that perky/deafening. But it is sometimes fussy to start. Last edited by Mark on Sun Sep 24, 2017 4:01 am, edited 1 time in total. Some old history of a steel scuba tank I used as a kid in the Florida Keys - it ran as shown in this pool but the 3/4 inch diameter plumbing pipe snorkel was terribly restrictive making it hard for it to breathe and thus a quiet kind of snorkeling. Also that's the longest snorkel length I could get to run using the only thing I had to work with, a 3/4 inch pipe thread hole. "What a big hunk of metal and how painful it is to see it struggling along, a jam jar Frankenstein conjured into existence, paraded about on a string, unethical to have brought it to life." As an aside this SCORKL clip seems to be or is presented as an innovative concept. https://www.youtube.com/watch?v=IPE6dsSFpNM but when trying to find the diameter of the Healthways tank, I think it's 6.5 inches as opposed to the aluminum 7.25 inch diameter tanks - too tired to go measure it right now. It's a tiny bit shorter than the 7.25 tank. Well anyway I ran across this ad. The tire pump inflator and gauges are a step up I suppose. "Taking a look back: Healthways Scuba, 1963"
The hazards of testing snorkelers ... they can be fussy. It's important to get enough fresh air when snorkeling as well as fueling. A little better here but still just a tease. Yea, it does jam. At first I thought I'd give it a go with the restrictive natural hole that it came with where the straw and a grommet fits through. That wasn't too smart even using watery methanol because it blew the lid off, but having some hindsight I wore my safety goggles before trying that. So then a half inch hole was drilled in the lid on the mini-lathe and it started up but began to die and jiggling it a bit brought it around and it ran fast or normal/typical I guess you would say. It was very hot out and sluggish weather for jam jarring. 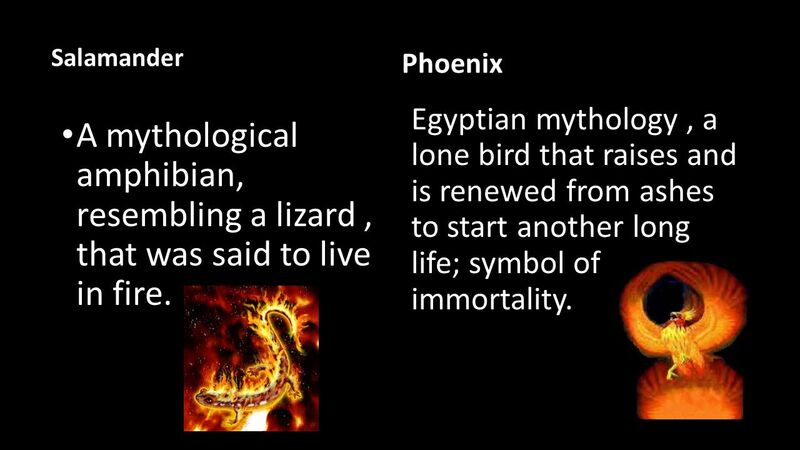 Also a snorkel was tried on top of the skull head, but it was too energetic and flamed out on the first whoosh or sudden hiss/blast. In thinking about smaller jam jars, there was this video that came to mind because of a passing curiosity to know the hole size. Looks like he's putting in about .6 cc and the vial I have that looks very much like the one in the video has a volume of roughly 22 cc. My vial is ~27 mm wide and ~57 mm tall so it's basically a typical ~1/5 diameter hole in the lid jam jar as Reynst suggests using. The opening on the mouth of the vial is roughly 17 mm. So as it happens there was a vial on my desk among a hundred other items that seemed to match the above demonstration in size and shape. And a quick look in the garage I came up with a 5 mm hole in some ~22 mm wide washer in lieu of the 5 yen coin. As an aside, our 5 cent nickel is about the same diameter if you drilled a 5 mm hole in it or a 21.21 mm diameter to be exact. The best part of doing this experiment is the zippy speed in which it runs/so full of life and this curious buzzing you get in your fingers when the vibrations from the combustion process resonate and try too push the washer away from the vial rim ever so slightly. If you're doing jam jars and especially small jam jars, having a finger pump mist sprayer and eyedropper really comes in handy. You can wet the rim of a jam jar or mist it making it more likely to start instead of having to shake the jar and dry the lid or you'll find other benefits and advantages of having these two items if you do jam jars often. When shaking the vial with the washer mimicking the video, the fuel tends to drip out around the sides for example but with a single drop from the dropper around the rim of the hole, that will get it without having to shake it to the point of leaking. There's so many times I reach for one of these two items to make life easier when testing. Also the eyedropper works like a syringe and you can refill it quickly from the bottle and guesstimate accurately enough to add the amount of fuel you desire. If you need, there're calibrated eyedroppers too. As you might guess the rapid combustion makes the vial quite hot quite quickly. Seems like it was pretty precarious chucking the long heavy tank in the chuck and then cutting the hole and threading it without it shifting or having it come loose. Usually you'd use a steady rest or tailstock as a secondary way to stead an awkward piece. But as in the previous video where the guy tried to make a bell by lathing a tank, he too found that tanks aren't truly round or a precise piece of material. So now I just have to hope it will run and not do something like this where it revs up and entropies being too long for the diameter or probably not an ideal ratio. In other news I bought a CO2 tank for 6 dollars at a flea market today. It's short and fat and wanting to look around more while not putting an old full CO2 tank in a hot SUV just for safety concerns, I discharged it next to some unoccupied building and for quite some time clouds of CO2 billowed at my feet until it was empty. It crossed my mind that it could shock me like the other tank I bought where the braided wire around the tubing was rusted breaking the continuity allowing for a hefty static electricity shock when I discharged it. This tank has rusty wire around the rubber tubing too. Recall with large tanks and bad continuity, firemen have been knocked to the ground by the charge that can build up. "During hands-on training with a carbon dioxide fire extinguisher, an employee experienced a static electric shock. The person described the sensation as, "A "solid" punch to the sternum and tingling sensations extending from both hands to just short of both elbows. The intensityof the tingling sensation felt similar to and slightly stronger than that experienced when shocked by household current. It subsided over approximately 20 minutes." "Before you pour flammable liquids ..."
In the one photo the piglet snorkeler has a 1.25 inch snorkel and it runs like a bat out of hell in cool weather. Today it ran and then quickly gave out, as well as another smaller tank not pictured that is the most forgiving one I have. I've left this smaller one outside for days with watery methanol remaining inside the tank and just walked over to it and set it off running full grease. Just too humid right now for even the proven ones. Don't know what plan of attack to take for the stubby red Buckeye CO2 tank. Love those little guys! Trying to catch up after a long work stint. Some weeks away from experimentatation still, unless I check responsibility at the door one day! I could try bang starting or igniting the scuba tank from the inside rather than at the tip of the snorkel with a spark plug or wire something. When you light the end of a long snorkel it seems like maybe the initial effect is putting a column of too much used up bad air ready to sluggishly travel into the tank so that initially you don't get the flow moving fast enough to refresh as well, I don't know? A bang start might give you better mixing, better starting swirl. And it may be with larger tanks the charge of airflow has to be absolutely smooth/coherent as it transitions from the snorkel to the combustion chamber. As it is now, the scuba snorkel transitions to pipe threads and then to a smooth region and then into the tank, the threading doesn't extent the full length of the neck by about 5/8 of an inch. At any rate when you rough up the air flow in the wrong place, whether working with the very large or very small, these small details affect performance. So perhaps however the slug of air breaks as it enters the chamber determines how deeply it can dive before breaking up. On my piglet snorkeler I have several reducers that screw into the 2 inch thread at the top of the tank to attach the snorkels, and even those variations on how the reducer stair-steps to a smaller thread makes some better than others, just that simple small distance and how it transitions affects the piglets. And the outflow phase is critical too, designing the best shaped path to escape while still providing good compression and good mixing. Ideally, perhaps the roof of a snorkeler should not be flat nor a long cone shape because the slug of air doesn't break away or entrain or swirl enough air as it enters the chamber. Also on typical jam jars, a very thin lid may not be the best hole in that a thicker lid perhaps would help to make the flow more stable or coherent. Extending on that thought, a full length snorkel, on some occasions, evens out erratic combustion to some degree over a simple hole. On teeny tiny jam jars like the small glass vial sizes, even something as simple as smoothing the rough edge of a seemingly neatly drilled hole with fine sandpaper may make some difference in airflow. Anyway, it's curious what's the best compromise for the roof or top of a jam jar jet or snorkeler. In other news, an all fused quartz jam jar jet arrived in the mail today! First on my block probably. Just hope it runs as you never know what missteps or overlooked details might set you back. If nothing else, at least it's a start. Maybe it could have been shorter for that diameter? Or with extra fuel maybe make an adjustment for that aspect, in effect raising the bottom. Or putting some of the sugar white beach sand we have here in the bottom, it's nearly pure quartz too. Perhaps it shouldn't have been a cylinder, say a more ideal shape with tapered sides like Reynst uses. Lots to think about. Even the skull head jam jar is now proving to be fussy with low repeatability. I've been planning to run it with a green boric acid flame but it keeps flaming out on me or running quite slowly. It seems the irregularities of a human skull disrupt a steady repeatable flow. As an aside, this is where the little quartz jam jar jet was born - in Lianyungang, China. "Donghai County has 70% of the national reserve of natural crystal, and is manufacturing 80% of China’s crystal products." "The recommended maximum operating temperature of our quartz products is 1200°C (2192°F)." This is the schematic of the quartz jar but I decided to go with a 7 mm hole instead of 8 mm. The crucible to the right of the drawing ran with a 6.35 hole for about a minute 10 seconds with an aluminum top. The Enfamil baby food jar on the left won't even start in hot weather but runs fine when it's cooler out. Of course I have to stop it for fear of it cracking but it's a good runner for the most part. I think the hole in that one is a dash over 8 mm. Excitement theater here lately. Too hot and humid so I don't feel like testing the quartz jar yet or anything else. A low temperature of 78 predicted for Friday night in October - normally it's cooler. And yet another possible hurricane predicted for Sunday. The Gulf of Mexico water temperature is quite warm so a weak hurricane can quickly spin up to something bigger. People are getting skittish, the base commissary already sold out of bottled water yesterday my neighbor said as he was unloading a few cases from his SUV with a dolly. Kind of an odd find - a jam jar with a squid. Not the best squid design though. 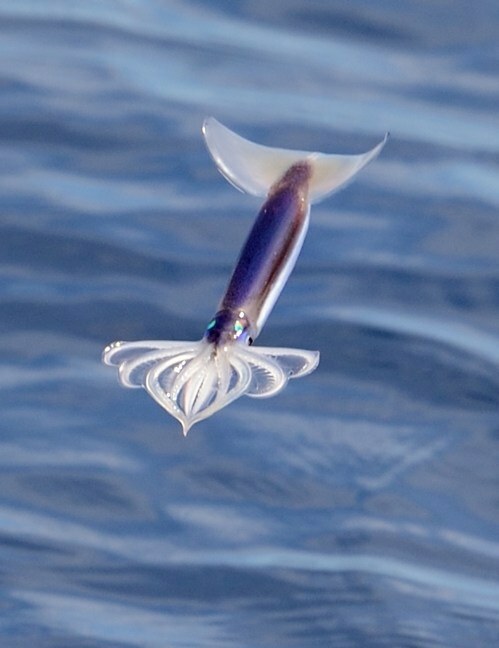 I like these neon flying squid and their tentacle airfoil technique. 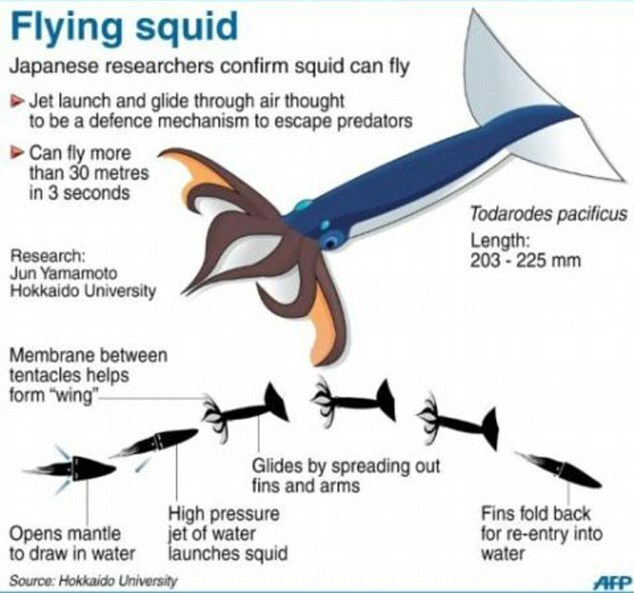 "A shoal of neon flying squid leaping above the ocean's surface." Last edited by Mark on Thu Oct 05, 2017 6:50 pm, edited 1 time in total. Thanks, I thought the quartz jam jar looked well-made too. It would be nice to make some toy of some sort using the jar, like a bubble blowing machine or tiny car or boat, something creative that doesn't require much power of course. After a few letters back and forth clarifying the English to Chinese barrier, it seems to be working out. Thought I'd try this other company with the next jam jar jet in the smaller size. The previous seller referred to the capped ends of the jar as "two bottoms with a hole in one bottom". This seller wrote "Do you want to weld the bottom or the back cover?" So I sent them a reference photo of the quartz jar I had made. I also inquired about some U-bend tubing in quartz. It's a pleasant albeit quirky transaction. I can't help but think an American company wouldn't even give you the time of day or even bother with a small fry/insignificant customer unless you had connections or were a major buyer. And it would cost a lot more. The U tube you're going to give me is the exact size. The squid pattern can be added to the container.